Many people may also refer to acid reflux as heartburn. 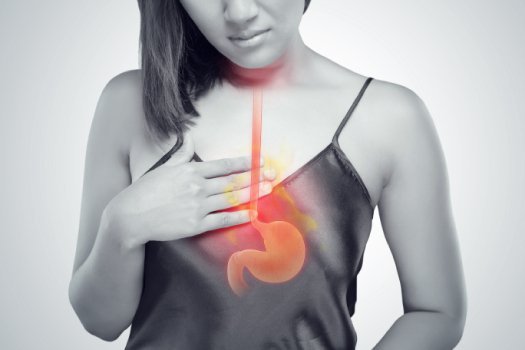 With acid reflux, you may experience a pain in the chest along with a burning feeling. There may also be a bitter taste in the mouth. When food travels down the esophagus and into the stomach, this can sometimes be regurgitated back up. As some of the stomach contents are acidic, this is where the bitter taste comes from. The acid which flows back up the esophagus can also be harmful. If you are experiencing acid reflux more than twice a week, you may have GERD or Gastroesophageal Reflux Disease. When you digest food, it travels down the esophagus. At the bottom of the esophagus, there is a gastroesophageal valve. This valve opens and closes to allow food and liquid into to the stomach. The gastroesophageal valve does not allow food back up through the esophagus. If this valve fails or becomes weak, some of the stomach contents may be allowed back into the esophagus. As a result of this, you may experience heartburn or indigestion. There are no specific types of people that experience GERD. In the western world, around 20-30% of the population will be affected. Usually, if you experience heartburn or acid reflux, a change in lifestyle is recommended. Some foods and drinks to avoid include caffeine, spicy food, excessive salt and fizzy drinks. Those who smoke and are obese, are more likely to experience acid reflux. If you have made changes to your diet and lifestyle and still experience heartburn, it is then recommended to see a doctor for a full diagnosis. Ginger tea has been known to help with heartburn and acid reflux. It is also recommended not to lie down within 3 hours of eating a meal. Meals before bedtime are also to be avoided and elevating your head and chest while you sleep can also help.